All of our Front Load drying systems feature vertical air flow. Air enters at the top of the drying chamber and flows downward, exiting through the grating at the bottom of the chamber. 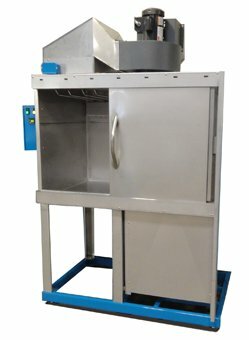 The "FLH" models depicted here have doors that open horizontally and accommodate taller parts, making them ideal for parts that exceed 24" in height and for parts, racks, or baskets that would dry most effectively with downward air flow. 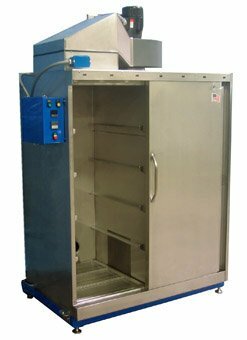 The vertical door front load dryers ("FLV" models) found here, have the same air flow pattern, but wider and shorter chambers. Hanger rods and a work rest are standard on all systems. Side wall brackets, designed to accept multiple shallow trays, are optionally available. As with all our dryers, the foam-insulated, double-wall heavy-duty stainless steel construction ensures quick heat up time and long equipment life. 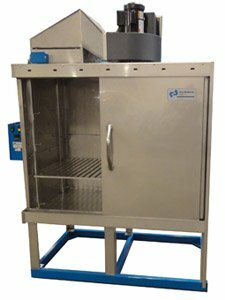 The air in the drying chamber is continuously circulated with a high velocity blower and reheated. So unlike some dryers that exhaust-large amounts of hot air into the room, these drying systems are energy efficient. 25" x 30 " x 30"
25" x 30" x 45 "
25" x 30" x 57 "